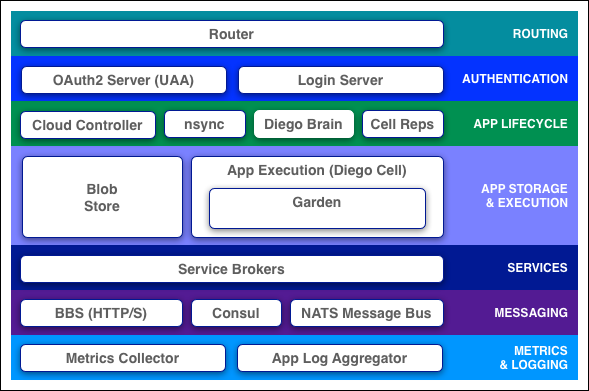 A platform used for running applications and services. The purpose of cloudfoundry is to change the way apps and services are deployed and run by reducing the cycle time of development to deployment. Cloud Foundry directly takes benefits of cloud-based resources such that apps running on the platform can be unaware of underlying infrastructure. It provides an arrangement to predictable and reliable running of cloud-native apps . and has a great range of application services. Also, Cloud Foundry is open sourced and controlled and governed by a multi-organization foundation ( nearly 60 companies ). It is a powerful thing when different technology companies, industries, and business lines collaborate with such strong cohesion and momentum. Cloud Foundry can be installed as a single developer environment (via BOSH Lite) for experimentation, but is typically deployed into a larger infrastructure cloud via BOSH. Supported platforms include AWS, OpenStack, vSphere, vCloud Director and vCloud Air. Details of Installation using Bosh Lite can be found at : BOSH Lite on github. Applications written in supported application frameworks often run unmodified on Cloud Foundry, if the application design follows a few simple guidelines. Following these guidelines makes an application cloud-friendly, and facilitates deployment to Cloud Foundry and other cloud platforms. Avoid Writing to the Local File System as Local file system storage is short-lived and instances of the same application do not share a local file system. For those desiring to achieve velocity and establish a development-feedback cycle—and for those challenged with responding to the technical driving forces relentlessly shaping today’s marketplaces—Cloud Foundry, as an established cloud-native platform, provides the most compelling way to enable the fundamental shift in the way we build and deploy software.